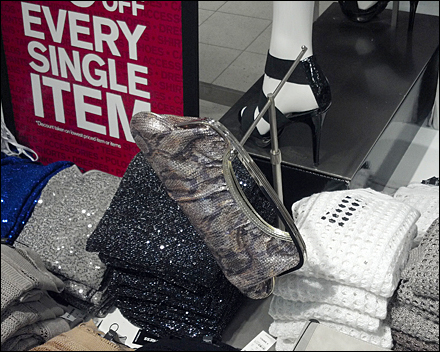 I’m not sure if this purse was placed asymmetric and angled on this T-stand, or originally centered and balanced, but teetered. In any event the teeter totter (refer to linguistic reduplication) cross merchandising adds to display diversity. 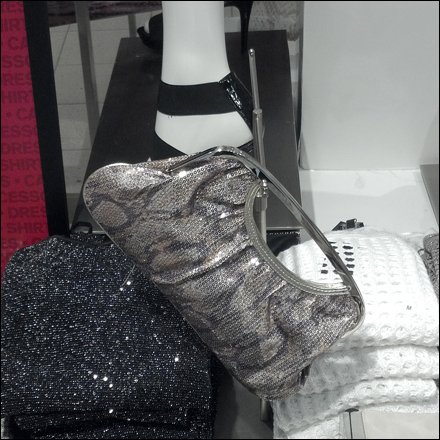 But I long for more of a contrast between purse and apparel background. A splash of purse color would help this otherwise monochromatic scene. CLICK the thumbnail for a closeup view. See that the table merchandise weighs down the T-Stand bas so that it can maintain its upright stance.